Customise a mug by having your own design, logo or photograph printed on high quality ceramic mugs. Perfect for personalised gifts, office or conferences or just to make your own coffee-time statement. Global Promo carry a great selection of custom mugs. These may include printed promotional mugs, porcelain mugs, personalised cups, bone china mugs, cafe mugs, tea cups, printed or engraved promotional stainless steel mugs and Maxwell Williams Range Mugs. They also offer anything from a logo mug with a basic text or logo to photo mugs with a photograph quality print. Printing can be one or two sided or a full wrap-around design, images or text or both. Usually there is only a small extra charge for a two-sided design and all promotional mugs can be printed in full colour. These promotional mugs are printed using either a dye-sublimation process or a off-set printing process, which is dishwasher safe or has and a dishwasher-safe coating. These printed photo mugs have longer life span and your logo mug will be in front of your customer longer, faithfully displaying your logo or corporate message, making it one of the most effective promotional products available today. Promotional mugs are wonderful low cost promotional items, just get that mug into your target customers' hands and you could be enjoying free promotions each and every day for months if not years. There are various popular ways to use these mugs in order to promote your business. 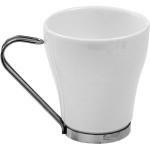 Hand promotional mugs out over the counter: Serve your customer a cup of coffee in your promotional mugs and make sure to give these mugs in decorative packaging as a gift. Give them away as social media gifts: You can use these mugs to entice your Face book like page followers or Blog subscribers. Use mugs in the company board room: If you are trying to impress your client then make sure your board room is stacked with different custom mugs that cater to your customers' drink of choice. Hand coffee mugs out at trade shows: Promotional mugs are traffic magnets where you will get people to your stand and that is where the selling begins. Sell promotional mugs: Promotional photo mugs are ideal for gift shops and popular restaurants. Charity and special causes: Give personalised or printed cups to people who support your cause, either through donations or participation in organised events. Allow us to do the legwork for you, we treat every client as important whether your enquiry relates to the smallest order or a 20,000 unit indent order.